Powers/Abilities: None revealed but they possessed technology greater than Earth with spacecraft able to travel quickly through interplanetary space. Traits: The Autans closely resembled humans from Earth and may possess greater than normal strength and endurance due to the planet's size, gravity or maybe evolved over time to handle the stress of physical labor in the Brain Master's mines. 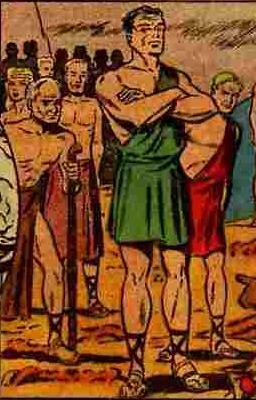 The Autan's wore clothing similar to style to the ancient Greek's. 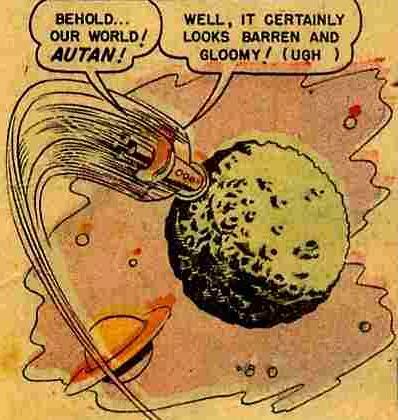 (Human Torch#34/3) - Autan was a small earth-like planet or moon orbiting a gas giant with fertile hills and valleys, snow capped mountains and home to race of peaceful humanoid beings. Sometime in the past the once peaceful planet of Autan was enslaved by an army of robot Cube-Men telepathically controlled by a being called the Brain Master. Having easily easily conquered the planet, the Brain Master forced the Autans to mine gold that the Brain Master needed as a food source. The planet over time became desolate and barren, and the Autans often faced hardships such as food shortages and clean drinking water. (Human Torch#34/3 - BTS) - The Autans elected a man named Grail as their leader. (Human Torch#34/3 (fb) - BTS) - Sometime in the past, the Brain Master blinded Grail's wife, Mara, to use her as an example of his absolute power and control of the people of Autan. (Human Torch#34/3) - When Autan's gold resources were nearing depletion, the Brain Master sent his Cube-Men to Mars, but found the planet lacked any viable metals. (Human Torch#34/3 - BTS) - Desperate for freedom and the proper necessities of life for his starving over-worked people, Grail led the Autan slaves to plot a revolt against the Brain-Master and his army of Cube-Men. (Human Torch#34/3) - The Brain Master sent his Cube-Men to Earth in search of gold and began stealing small amounts from startled residents (a man's watch and a woman's gold ring) of New Mexico. Having swiftly learned the Human language, one of the Cube Men called Bokx learned of a "Golden Goddess called Sun Girl." Via an electro ray to render Sun Girl unconscious, Bokx abducted her from a Hopi Festival of the Sun where she was being honored. (Human Torch#34/3) - While en route to the planet Autan, the Cube-Men leader, Bokx, revealed to Sun Girl that he and his fellow Cube-Men would cease functioning if they could not provide the Brain Master gold for nourishment. Arriving on Autan, Sun Girl was brought before the Brain Master who ordered her to give up the gold that she was wearing and was interrupted by another of his Cube-Men who informed him that the human Autan slaves were revolting and refused to mine gold. Enraged, the Brain-Master ordered his Cube-Men to exterminate the Autan slaves, but was convinced by Sun Girl to allow her to speak with their leaders and negotiate a settlement where the Autans would return to work in his mines. Bokx and Sun Girl approached Grail, who was in the process of fighting a group of Cube-Men that had been sent to kill the slaves. Sun Girl convinced Grail to end the revolt and later secretly planned with Grail a means to destroy the Brain Master and end his reign. The Autan slaves went back to work while Grail (who gave himself up as a hostage) and Sun Girl were bound with their hands tied behind their backs, and taken to the Brain Master. Sun Girl used her wrist ray and burned Grail's wrist bindings and in turn he used a knife to free her as well. Now able to act, Sun Girl proceeded to blast the Brain Master with her wrist ray while Grail, using only his fists, fought off the Cube-Men. After a few blasts, the Brain Master -- who was unable to withstand Sun Girl's attack -- quickly died as a result. With the Brain Master dead, all his Cube-Men stopped functioning and became inert and would eventually rust away as scraps of metal. The Autanians were now free to rebuild their civilization free of evil. Comments: Created by unknown writer, Ken Bald pencils, Syd Shores inks. The planet Autan's location and solar system was never revealed in the story. Speculation on my part places it Earth's solar system and that Autan was/is a moon orbiting Jupiter or Saturn. I get this assumption from the simple facts that (a) The Cube-Men themselves were familiar with both the planet Earth and Mars while in search of gold; (b) When Sun Girl was captured and brought aboard the Cube-Men's spaceship it mentioned in the story they traveled through interplanetary space to get to Autan. In my understanding of the term "interplanetary space," this implies travel between planets within a solar system; (c) The Autan's themselves were basically human and may have been native to Earth sometime in the past and were abducted by the Brain Master there and brought to Autan to act as slave labor. First, regarding point B about "interplanetary space. In comics, you sometimes have to look for what makes sense, as opposed to what is utter nonsense. Keep in mind the story was written in 1949, when the understanding of the nature of the solar system, planets, galaxy, and universe were pretty weak compared to now. "Inter" means between. Interplanetary means between planets. Interplanetary space means the space between planets. The commonly accepted definition would indeed be a reference to space between planets within a solar system. Unless Autan is supposed to be a name for some other planet or moon or planetoid, on which Sun Girl can survive and is essentially Earth-like in atmosphere and other conditions...which also wouldn't be the case in any of the other planets or moons in Earth's solar system, though there could be an artificial environment, such as is seen on Titan. You'd think the writers would have referenced that what we call "Mars," (or whatever), the natives call "Autan." The planet doesn't look like any planet in Earth's solar system...could be a moon of Saturn, I suppose, as a ringed planet is seen in the background, but otherwise close proximity. Could conceivably chalk it up to artistic license! But, it is not out of the range of possibility. Taking the strict definition of the individual worlds is a more logical assumption...they traveled through the space between their planets to get there. Writers frequently underestimate time and/or distance, such as noting something to be "millennia ago," when really millions or even billions of years is more appropriate. Still, millennia is not wrong, just misleading. As another example of a misleading term that leads to underestimation of the extent/magnitude of an alien: Extraterrestrial would seem to imply someone from off Earth though still from the same universe, but the strict definition of the word would also apply to someone who is extradimensional, or even potentially from an alternate Earth/reality. Another take would be that they traveled within Earth's solar system during part of the journey...maybe they had to get out of the solar system before warping into hyperspace, or something. Yet another possibility is a planet in another dimension, one to which they initially traveled through interplanetary space during their journey before entering a dimensional warp...perhaps no one involved in the journey realized the dimensional travel. Most importantly, in terms of context, is that they don't just say "interplanetary space." They say "the swift but long journey to the other realms of inter-planetary space." the "other realms" portion, TO ME, infers a distant part of space outside Earth's solar system, though we'll never know for certain until/unless another story references it more clearly...which is pretty unlikely. The Sun Girl profile in the OHotMU notes that the Brain Master and the Cube-Men were the natives of Autan, while the people present there were human slaves brought there. The people on Autan are referred to as "human slaves," and Sun Girl says they are "human like her," but the Brain Master also refers to her specifically as "Earth girl," which strikes me as indicating she was different from the people on Autan. Even Grail refers to her repeatedly as "Earth Girl," which doesn't seem like something someone from Earth would say to another person from Earth. I'd take the human reference as meaning they were humanoid/flesh and blood, as opposed to the automaton Cube-Men and the freakish Brain Master. Regarding point A, it is common, especially in older comics, to have alien races be familiar with Earth, as if Earth were the center of the universe. Of course, everyone on Autan speaks English...but that's how it was with these stories. It is also unrevealed if the Brain Master was somehow a mutant, mutate from the planet Autan or his appearance and abilities were common to his race and if so are there others similar to him living on an unknown world in another galaxy or solar system. I didn't see any references to the Brain Master conquering the humans, so we don't know if he came from another world or not, but I agree with your assessment that both the Cube-Men and the humanoids were native to that world. I'd personally think the Brain Master was a mutate/mutant that created the Cube-Men, either via his own mental powers or by telepathically controlling others, and he controlled the others on Autan before being destroyed. But we don't know for sure. The Brain Master in the story was called the Brain Monster by the Autans, and in a few lines was also simply called the Brain. The Brain Master was what his Cube-Men called him. Since they were telepathically controlled by him, this is would be his actual actual name. Autan is a French word meaning an impetuous wind or Southerly wind. Autan is also a region in Mexico in San Blas in the State of Nayarit along the Pacific coast. any character with the name Brain or Brain Master or any other similar sounding name. (Human Torch#34/3) - Grail was a strong man with exceptional fighting and leadership ability and was husband to Mara. His wife, Mara, was blinded by the Brain Master sometime in the past as an example of his absolute power over the Autans. 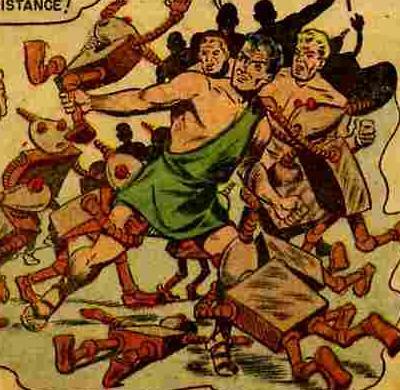 He was elected as leader of his people and plotted a revolt against the Brain Master and his army of Cube-Men. During the revolt, the Brain Master ordered his death along with all the rest of Grail's people and sent his Cube-Men to exterminate them. In the process of fighting the Cube-Men, Grail was convinced to cease all hostilities and have his people resume their mining for gold by Sun Girl. He secretly plotted with Sun Girl to attack the Brain Master, and both were bound and taken before the evil monster. Able to free himself via Sungirl's wrist ray, Grail used a hidden knife and cut her loose. Grail began fighting off the Cube-Men while Sun Girl proceeded to blast the Brain Master with her wrist ray until it died. He later returned Sun Girl to Earth and was now free to rebuild Autan's civilization. 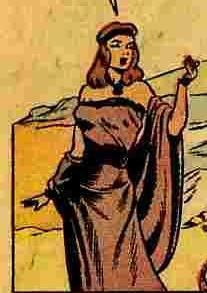 (Human Torch#34/3) - Very little is known about Mara other than she was the wife of Grail, leader of the Autanian slaves. Sometime in the past she was blinded by the Brain Master as an example of his absolute power. 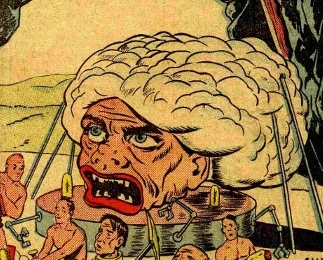 The Brain Master is/was essentially a giant head with a massive brain. He possessed telepathic powers, which he used it to animate the robotic Cube-Men to act as his body. He could direct them across even interplanetary distances (see comments). He fed ravenously on gold, and he had a set of robotic arms connected to the platform on which his head rested; these arms continuously fed gold into his giant mouth. (Human Torch#34/3 - BTS) - Using his vast telepathic abilities and strange hunger for gold as sustenance, the Brain Master created an army of robots he dubbed the Cube-Men, who conquered and enslaved the humanoid population of the planet Autan and forced the population into mining their planet. After years of strip mining the planet, Autan became a desolate world with limited resources. (Human Torch#34/3-BTS) - Under unspecified circumstances, the Brain Master blinded Mara, the wife of Autan leader Grail, as an example of his supreme power. (Human Torch#34/3-BTS) - When Autan's gold resources were near depletion, the Brain Master sent his Cube-Men to Mars but found the planet lacked any viable metals. (Human Torch#34/3) - The Brain Master next sent his Cube-Men to Earth where they landed in New Mexico and began stealing gold from startled citizens. One of the Cube Men called Bokx, having quickly learned the Human language, learned of a "Golden Goddess called Sun Girl. He abducted her from a Hopi Festival of the Sun where she was being honored and brought her to Autan in front of the Brain Master who ordered her to give up all the gold she wore. Learning from one of his Cube-Men that the Autan leader Grail and his people were revolting and had ceased all mining operations, the Brain Master ordered his army to exterminate every Autanian on the planet. Sun Girl convinced the Brain Master to allow her to speak with the leaders of the resistance and persuade them to return to work in the mines. She succeeded in ending the revolution and was bound alongside Grail and taken before the Brain Master as hostage. 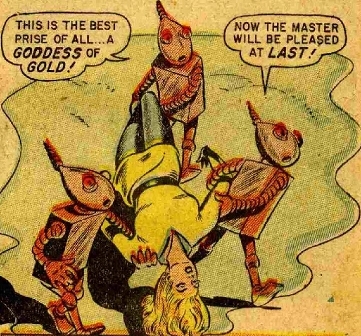 With the Brain Master unaware that both Sun Girl and Grail secretly plotted against him, they freed themselves from their bindings and Sun Girl blasted the Brain Master many times with her wrist rays until it died. No longer under telepathic control by the Brain Master, his Cube-Men became completely inert and ceased functioning. It was believed that over time they would rust into scraps of metal. (Human Torch#34/3) Bokx was one of the Brain Master's loyal Cube-Men and acted as their leader. The Brain Master sent Bokx to Earth in search of gold, and he quickly learned to speak and understand the English language. Hearing about an Earth woman called Sun Girl who was being honored as the "Golden Goddess" by a group of Hopi indians, Bokx abducted her at the festival and brought her to Autan via a rocket ship to appear before the Brain Master. When the Autanians began to revolt, Bokx escorted Sun Girl in search of Grail to speak to the Autanians and have them return to mine the planet. When Sun Girl succeeded in stopping the Autanians revolution, Bokx took Grail as hostage alongside Sun Girl and brought them before the Brain Master. When the Brain Master was slain by Sun Girl, Bokx along with all the Cube-Men, ceased functioning, fated to eventually rust away. (Human Torch#34/3) The Cube-Men were robots created by the Brain Master and were controlled telepathically. They were used by the Brain Master to keep the Autanians under control and were also sent to seek out other worlds rich in gold (on which the Brain Master fed) and bring it back to Autan to feed his strange hunger. Landing on Earth in New Mexico, a group of Cube-Men lead by Bokx began stealing gold from startled citizens and abducted Sun Girl believing her to be some sort of "Golden Goddess" and brought her back to Autan to the Brain Master. When the Brain Master was slain by Sun Girl, all the Cube-Men ceased functioning and presumably rusted away into scraps of metal. 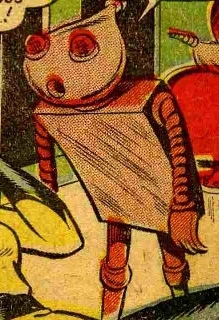 The Cube-Men were small, roughly the size of a child, but possessed increased strength, speed and the ability to quickly process vast amounts of information to the degree that they were able to rapidly learn alien languages. They were also equipped with hand weapons called electro-rays that could stun and render a target unconscious.